After the team and individual all-around gymnastics finals, the world finally got to see what one of the greatest gymnasts of all times looks like. And as she goes through her individual events, she just continues to prove it. After the vault and beam, Simone Biles' last Olympics event will be one of her favorites — the floor. On Tuesday at 1 p.m. ET, Biles will compete one last time in the 2016 Olympics in Rio as she looks to win yet another gold. She helped bring Team USA a gold medal in the team all-around, and then she killed it at the individual all-around, earning herself another gold, while teammate Aly Raisman nabbed the silver. And to kick off the individual event rounds, Biles won gold in the vault competition with a margin of .713, which, frankly, is completely mindblowing. As USA Gymnastics pointed out, Biles is the first United States woman to win three Olympic golds in single games in gymnastics. She's also the first to win the Olympic title on vault. 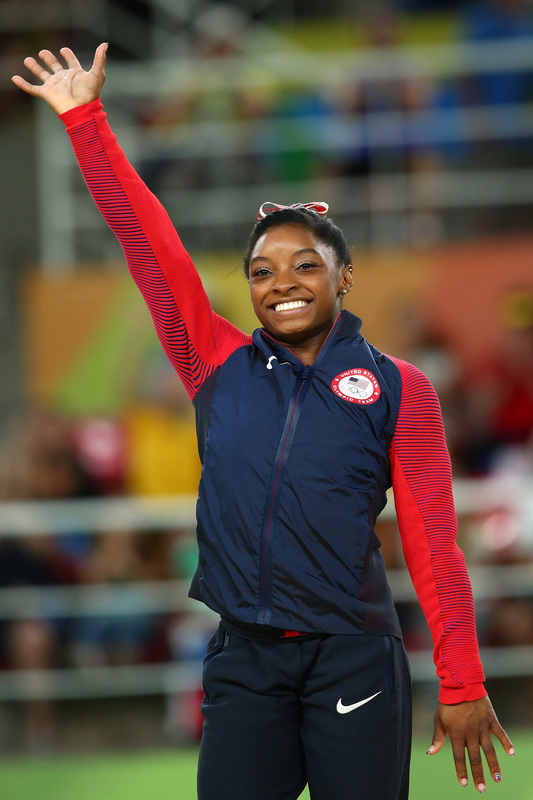 At only 19 years old, Biles has been making history since she stepped foot into the spotlight. Her Olympics debut was widely anticipated, and as her competitors have pointed out, she's kind of in a league of her own. Biles may very well dominate the sport of gymnastics entirely, but her favorite is the floor. She even has a signature tumbling pass that she often performs that is known as "The Biles." She got first place in the floor exercise qualification rounds, scoring a 15.733 once difficulty and execution were taken into consideration. And on Tuesday in her last competition at the Rio Olympics, we'll have a chance to see her possibly improve that score with a beautiful performance in the finals.